Make your own Beer Stickers with Custom Text, Personalize Color and Photos at Affordable Prices. Custom Beer Bottle Labels with your photo or company logo. great business endeavor for those who enjoy small batch brewing. You can also make your own design and print with LabelsOnTheFly.com. Premier online source for high-quality full-color professional-quality marketing materials. Our minimum quantities are low in order to meet more customers requirements and all of our products are printed on state-of-the-art equipment with an unsurpassed attention to quality and detail. We take pride in providing you with easy ordering, effortless process, and exceptional results. How to design your own Beer labels? We’ll show you how to design an awesome looking beer label with a complex logo in Adobe Illustrator. Home wine making is considered an artistic, creative hobby and is enjoyed by a large number of today’s society. This is partially because both kits and ingredients are inexpensive. However, if you’re looking to save money you can always create your own kit from readily available products. Here are the various items you’ll need to purchase in order to build your own wine making kit. 1) Purchase a large jug of bottled water, a 5 to 7 gallon size. This will become your fermenting vessel. 2) You should try to buy a large amount of unsweetened, white grape juice frozen concentrate. You’re looking for enough to make four gallons of juice. 3) A tube of clear silicone caulking and 2 three foot lengths of aquarium tubing, one for your airlock, the other for siphoning off your home brew. 4) The only thing you will need to purchase once you have your kit ready is wine yeast. While bread yeast in readily available in a pinch, wine yeast is highly recommended as it tend to make a far superior wine. When you get home, remove the lid from the water jug. Place a dishtowel or other cloth over the jug opening. Drill a hole in the center of the jug that will allow you to insert one end of the tubing snugly. You want to keep the hole as close as possible to the diameter of the tubing. Insert the tubing until you have at least two to three inches inside the cap. Apply silicone around the tubing on the inside and outside of the cap and let dry overnight. You have now made your airlock and bung. Now that you have your brewing equipment ready to go you can begin making wine. Directions can be found here. Once your wine is finished you can now think about branding and labeling. Many wine bottles have two labels, the front label (which gives the name of the wine and is meant to grab the consumer’s attention), and the back label (which can include the more useful information, like total acidity and pH level). A variety of uniquely shaped wine bottle labels and hang tags designed to make your wine perfect for holiday get-togethers, wedding gifts and other special occasions can be found at Labels on the Fly. So you’ve decided to invest in the world-wide trend of home wine making. Owning your own micro-winery equipment is cost effective and the actual hobby is fun and allows for lots of experimentation. That, and it’s an opportunity to produce one of the world’s oldest and most beloved beverages. Below are some tips for wine bottling that will help you take what you’ve produced and turn it into a full-on finished product. 1) What type of bottle should you use? There are a surprising number of different wine bottles to choose from, and you need to keep in mind what will be the best style and size for your wine. You should also consider whether or not your wine will be fermented before being placed into the bottle or afterward. Having said that, bottles can range in shape and size from narrow and tall (for Mosel and Alsace wines), to tall with sloping shoulders (usually used for Bugundies and Rhone varieties of wine), to thick-walled with sloping shoulders (most commonly used for sparkling wines and champagne). Most wine bottles come in brown (Rhine or Alsace), clear (used for sweet wines and white wines), dark green (red wines), and light green (dry white wines). There are no strict rules to bottling your wine – in fact many wineries experiment with color, shape and style to make their wines stand out- but, as stated earlier, there’s a lot to think about when it comes to bottling wine so make sure to research thoroughly before deciding on what type of bottle to use. Deciding on whether or not to use a cork or a crown-cap depends mostly on two things; the style you’re going for, and what kind of impression you want to make. Wine corks can be made of either a single piece of cork, or composed of particles, as in champagne corks. The study “Analysis of the life cycle of Cork, Aluminum and Plastic Wine Closures,” commissioned by cork manufacturer Amorim and made public in December 2008, concluded that cork is the most environmentally responsible stopper. However, a 2005 closure study showed that 45% of corks did not prevent gas leakage during pressure testing both from the sides of the cork as well as through the cork body itself. The majority of non-sparkling wine production now uses these caps as a cork alternative as it’s much cheaper. So, again, it all comes down to opinion. Whether you want to go with a more environmentally friendly cork that’s got that old-fashioned, traditional style to it, or the more practical crown-cap that’s slightly more reliable but less safe for the earth, well, it’s up to you. It’s the wine inside the bottle, not the cork plugging it, that counts. 3) Labels and hang tags? After you’ve chosen your bottle and bottle-stopper, it’s time to start thinking about packaging and labeling. A label is very crucial as it shows the type of wine and date of the wine (two things you’re customer will be interested in knowing). 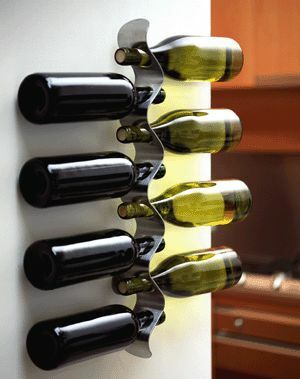 It also can help show your specific winery style. Wine labels are often very affordable and can come in a variety of shapes and materials including transparent adhesive paper, foil paper, and top grade paper. If you want to avoid hand-labeling every bottle you produce, try going with the simpler, more decorative hang tag. A wide variety of expertly designed, customizable wine labels and hang tags can be found at Labels on the Fly. 4) Where will it be stored when you’re done? Most wines should be stored in a dark area as UV rays can cause wines to become ‘light struck’ and pick up an unpleasant smell. Darker bottles are better protected from this, but not enough to be stored in direct sunlight. If you’ve decided to cork your bottle you should store it on its side, as bottles kept upright for too long will dry out and spoil. Make sure the temperature in the place of storage is kept constant – it should never go over 75 degrees F (24 degrees C). Letting the temp drop below 54 degrees F won’t hurt it, mind you – it will just slow down the aging process. It’s also a good idea not to move the wine. Try to keep it isolated and make sure to store for an appropriate amount of time. And remember to adjust the temperature before serving. There you have it! Bottling wine, while slightly less simple than switching the channel to the evening news, can be a fun way to make your wine more self-styled and personalized. Good luck on bottling your new batch of home-made wine, and stay tuned for more wine making tips and recipes!